Acroprint 125 and 150 ribbon. Made-In-USA with genuine Egyptian low lint cotton. They print sharper and last longer. Excellent Value! Does what Rapidprint does, for less. SAMS# 783625627 / 7HE23 Quietest Operation. One Year Factory Guarantee. ET model without digital display. Fast shipping. Made In U.S.A.
100 employee facial recognition system expandable to 250. Get all the benefits of the Acroprint timeQ+ software, with a facial verification reader. Includes PC Punch Software. 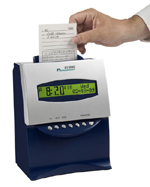 Rugged Time Clock for "nice" to Very Rough Conditions. Made in USA. 110VAC. Ships in 24 hours. 100 employee self totaling time clock, atomic clock accuracy. Fast and easy employee punch IN and OUT. Acroprint PC Punch for networks. 50 employees on up to 50 PC's. Upgrade in steps to 250. Punch IN and OUT on the individual employees work station. 50 employee software, upgrades to 250. Includes Scheduling, 15 RFID badges. USB, USB drive, and Ethernet ready. ONE left at this price! 50 employees on one PC, upgrade to network/50PC's. Excellent Value, includes scheduling! 30 day free technical support included.